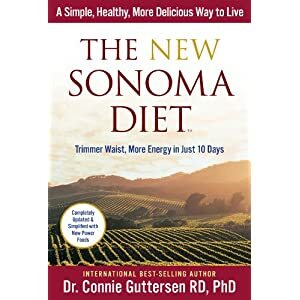 Last year I read The New Sonoma Diet: Trimmer Waist, More Energy in Just 10 Days, by Dr. Connie Guttersen, RD, PhD, published in 2010. Per Amazon.com’s rating system, I give it four stars (I like it). The New Sonoma weight-loss method works because it counteracts the major cause of overweight—excessive consumption of sugars and refined starches—through portion control. This Mediterranean-style program is likely to reap the major health benefits of the traditional Mediterranean diet: longer life and less chronic disease (heart attacks, strokes, high blood pressure, diabetes, dementia, and cancer). Most of the food recommendations herein are consistent with Monica Reinagel’s wonderful new book, Nutrition Diva’s Secrets for a Healthy Diet: What to Eat, What to Avoid, and What to Stop Worrying About. On Sonoma, you’ll eat natural, minimally processed, whole foods. The primary improvements over the 2005 version of Sonoma are the time-saving and budget-saving strategies. The recipes are easier and quicker. I didn’t try any, but they sound yummy. Dr. Guttersen also exands the “Power Foods” from 10 to 12, adding beans and citrus fruit. I’m glad to see the author addressed many of my criticisms of her great 2005 book. I do miss the old refrigerator-ready pull-out depicting the subdivided plates. Here’s a brief summary for those unfamiliar with Sonoma. There are three Waves. Wave 1 lasts 10 days and is supposed to break your addiction to sugar and refined flour. Wave 2 lasts until your weight-loss goal is reached, and provides more calories, wine if desired, and more variety. Wave 3 is the lifelong maintenance phase: more fruit and veggies, plus occasional sugary desserts, potatoes, and refined flour. Portion size is controlled either by following her exact recipes or through her plate method. Breakfast fits on a 7″ plate (or 2-cup bowl), while lunch and dinner are on 9″ plates, subdivided into various food groups such as proteins, grains, or veggies. Optional recipes are provided for Wave 1 and the first two weeks of Wave 2. As in 2005, Dr. Guttersen doesn’t reveal how many calories you’ll be eating. My estimate for Wave 3 is 2000 a day. Less for the earlier Waves. You’ll find indispensible information on shopping and food preparation. Keeping a food journal is rightfully promoted in certain circumstances. I like the discussion of psychological issues, mindful eating, dining out tips, and weight-loss stalls. The mindful eating portion reminded me of Evelyn Tribole’s Intuitive Eating: A Revolutionary Program That Works and Intuitive Eating: A Practical Guide to Make Peace with Food, Free Yourself from Chronic Dieting, Reach Your Natural Weight. The author makes a few claims that are either wrong or poorly supported by the scientific literature. Examples include: 1) beans are linked to longer life and reduced heart disease risk, 2) grapes are almost as good as wine for heart protection, 3) the health benefits of spinach “border on the miraculous,” and spinach helps prevent inflammatory conditions such as arthritis and asthma, 4) whole grains prevent stroke, gastrointestinal cancer, and diabetes, 5) adding salt and butter for flavor is unhealthy, 6) medicinal qualities of herbs and spices are well documented, 7) saturated fats “are found exclusively in highly processed food products,” 8) you’ll break a lifetime craving for sugary sweets in Wave 1, 9) 64 ounces of water a day is ideal, 10) exercise significanlty helps most people with weight loss, 11) low-carb eating cannot be maintained because it’s unhealthy and unsatisfying, and 12) saturated fats raise the risk of heart disease. Much of the book reads like an infomercial; at times I even wondered if it was ghost-written by a marketing professional. The author is unflaggingly optimistic. The testimonials would have more credibility if attributed to full names, not just “Betty” or “Bill.” She overstates the health benefits of the individual Power Foods, which are all plant-derived. I’d like to see cold-water fatty fish on the list. Dr. Guttersen has great faith in observational studies linking specific foods to health outcomes; I have much less faith. Such studies are far from proof that specific foods CAUSE the outcome. They’re just associations, such as swimsuit sales being linked to warm weather. Warm weather doesn’t cause folks to buy swimsuits; the desire to swim does. Speaking of associations, a multitude of observational studies link whole grain consumption with 20-25% lower risk of heart disease. We may never have proof of cause and effect because the appropriate study is so difficult. Sonoma recommends two whole grain servings a day, which is the heart-healthy “dose” supported by science. The author’s discussion of exercise is improved over 2005’s, but is still minimal. Why not refer readers to respected Internet resources? We agree that exercise can help with weight-loss stalls and long-term maintenance of weight loss. Overall, this is one of the healthiest weight-loss programs available. The average person won’t go wrong with Sonoma. In fact, Sonoma-style eating may be the healthiest of all for the normal-weight general public, with the exception of its avoiding saturated and total fat. This entry was posted in Diet Reviews and tagged book review, Connie Guttersen, New Sonoma Diet. Bookmark the permalink.